The bottom photo is from the late Barbara Irwin’s page on Liberal, Missouri which is no longer available. I worked with it some restoring it, and it happened to come out really well. 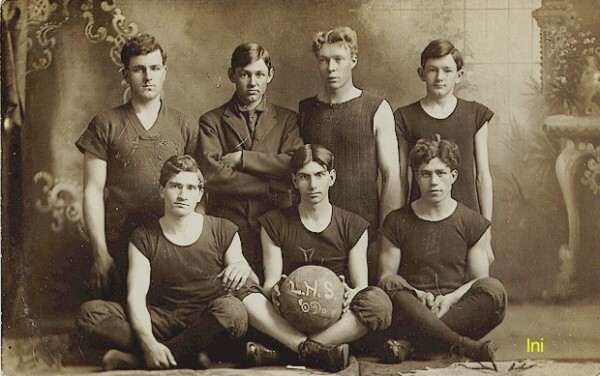 What we have here is the Liberal High School basketball team in 1909, photographed at Fritts Studio. The backdrop is the same as in a photo of Pansy Noyes that I have. This is the basketball team that I played with this winter, we lost only one game and that was with the champion amateur team of Missouri. Funny, I would have thought Clyde Lavery was the coach, decked out in his suit. I don’t see Jesse Harvey in the 1910 census. 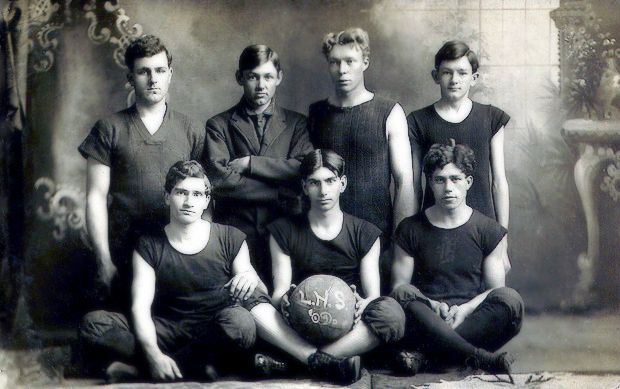 Clyde Lavery is in Farmington, San Juan, New Mexico in 1910, given as 18 and born in Missouri. His father is born in Colorado and his mother in Kansas. He is a “partner” in the household of 25 year old Joe Travis, born in Colorado, doing odd jobs. With him is father John H. Lavery, age 50, widowed, born Colorado and his parents born in England. John H. Lavery is in the 1910 Ozark, Barton, Missouri, born in Wisconsin, with his father born in Wisconsin and his mother in England. His wife is Sarah L., age 30, b. in Missouri. There is John C., age 8, and Byrdie, age 7. Tom Lavery is perhaps Thomas C. who is 16 in the 1910 census and in Liberal Ward 2, Barton, Missouri in the household of Walter Lavery 42, married 19 years b. Wisconsin, father born in Wisconsin and his mother in England. His wife is Vesta, 39, who has had 2 children. There is also a daughter in the household, Louise, who is 18. Vesta and both children were born in Missouri. The father is a superintendent to do with a coal business. Though Clyde and Tom Lavery look enough alike to be brothers, they would instead be cousins. Archie Wimmer is easily identified as Archie Y. in the Liberal Ward 2, Barton, Missouri 1910 census. The father is Oliver P. Wimmer, 45, married 19 years, born in Indiana, a salesman of general merchandise. The wife is Annie born in Iowa, age 41. Archie was born in Texas and is 18. John P. is 16, Winfield is 14, Helen is 9 and Dorothy is 4, all born in Missouri. In the 1910 census we find in Liberal, Ward 1, Barton, Missouri, Earl Creamer as the son of Frank and Nora. Frank is 46, b. Missouri, married 20 years and is a laborer at the brick plant. Nora is 36 b. Missouri. Earl is 19 and also works at the brick plant. In the household also are Landis 16, and Hazel 14, both born in Missouri. Earl Barrett is perhaps the son of William and Ellen in the Duenweg, Jasper County, Missouri 1910 census. William is 44 and works as a shoveler at a zinc mine. A son William also works at the zinc mine, as does Earl who is 20 and also a shoveler. Both William and Earl were born in Missouri. There are three girls: Stella 19, Golden 12 and Mary 8 all of whom were born in Texas. I can’t promise this as “the” Earl Barrett as I don’t see them in the 1900 census in Barton County or Jasper. Jesse Harvey is also in the 1900 census in Ozark, Barton, Missouri, age 11. His farther is Millard, age 44, a farmer. Cornelia, wife is 40. Walter is 20, Grace is 15, Isa (a daughter) is 13, then Jesse, and Herbert who is 5. All were born in Missouri.